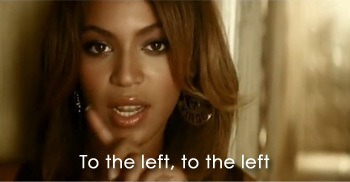 What does Beyonce have in common with Bernie and Jeremy? They all are not afraid of shifting people to the left. Whilst Beyonce was singing about sending a man packing “everything you own in the to box to the left”, Corbyn and Sanders have always had a different “left” on their minds which is moving the political landscape to the left. With recent political events such as Brexit, Trump becoming President, the rise and fall of Le Pen in France it appears that politics has turned all the way right. However there is not one sole reason as to these events, issues such as Brexit are multi faceted and not everyone who voted to leave the EU would consider themselves as right-wingers. 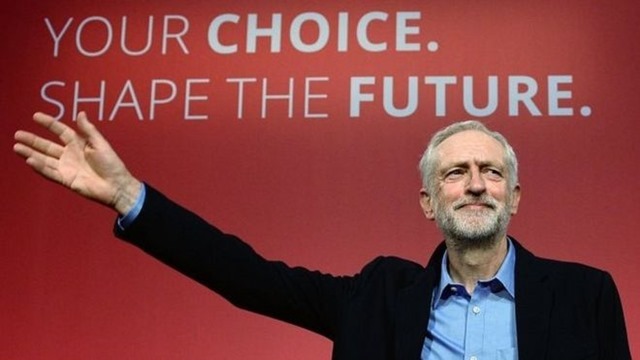 Political commentators have been discussing the emergence of right, but what about the left? There has been a talk of ‘the left being dead’, after the American elections last year and from the Tories winning with a majority in the general election 2015. There were questions as to why both Labour and the Democrats, who had enjoyed power for a period of time were losing support from their core members. Both parties had taken their core support for granted in recent elections.Bernie Sanders, ‘America’s Jeremy Corbyn’ and his equivalent ‘Britain’s Bernie’ both have tried to address these issues and to engage with those who their parties had left behind. 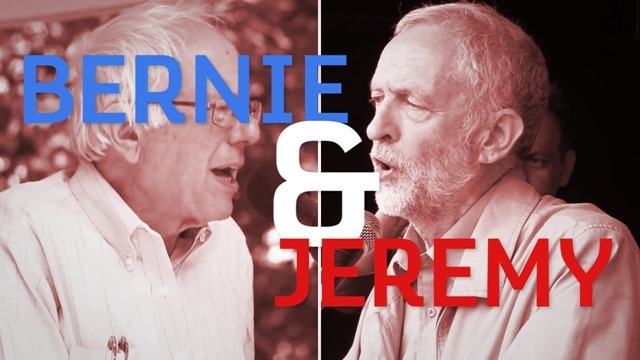 Is ‘Bernie’ Jeremy and is Bernie ‘Jeremy’ ? Both Bernie and Jeremy have lead anti-establishment campaigns in the hope of convincing the the working class, the average Joe, minorities, the young and women; that their left-wing movement is the best political choice to make. There are striking similarities between the men, they both have opposed inequality and their theme is redistribution of wealth and income from the very few to the majority. Additionally, both men though old have been able to connect with the young (Sanders is 75 and Corbyn is 68) which is something that the other politicians on their election campaigns could not do. They both have offered policies that are appealing to the young e.g. Labour promising to abolish university tuition fees during the recent election and Sanders’ plan to make tuition and fees free at public colleges and universities. They also both know how to run effective social media campaigns, you only have to look at how their supporters rallied around #FeeltheBern and #JezWeCan. A difference to point out is that Sanders is not a party politician, he was the first independent to be elected in the US House of Representatives in 40 years and Corbyn has always been a party man (this can point be debated with his voting record with Labour). During the general election, Bernie Sanders praised Corbyn’s campaign and his efforts to reshape Labour and the UK. He shared his commonalities with Corbyn and said, “What has impressed me-and there is a real similarity between what has he done and what I did-is he has taken on the establishment of the Labour party, he has gone to the grassroots and he has tried to transform that party…and that is exactly what I am trying to do”. He further added that he was impressed by Corbyn’s willingness to speak about class issues that affect not only the UK and America but the world. Have they moved ‘everyone to the left’ ? Sanders and Corbyn have a lot in common as discussed above, but has their anti-establishment movement resonated with the majority? Have they shifted everyone to the left or will Bernie and Jeremy have to pack their political boxes to the left? According to Morning Consult’s poll, Mr Sanders is here to stay. A poll released on July 11 Senator Bernie Sanders was the most popular politician in the Senate with a 75% approval rating. In like manner, Fox News conducted a poll in April and found Sanders was the highest favourable politician at 61%. In addition, PolitiFact supported the claim Bernie Sanders is the most popular politician in the United States even though he lost to Hillary Clinton. This evidence supports the argument that Bernie Sanders along with his views and policy proposals are liked and supported by the American people. In March, Bernie told a crowd in ‘Trump Country’ West Virginia that “healthcare was a right” and this was met with a round of applause. Bernie spoke to Trump supporters in a rural town hall on a number of topics like climate change, healthcare, free higher education and this was met with warm reception. This demonstrates the ‘Bernie effect’- he has been able to speak on issues that everyday people care about. This also supports the notion that the country is moving towards the left and more are open to progressive policies. In a June poll by USA Today found that only 12% of Americans support the Senate Republican health care plan. Sanders remarks at the NAACP convention that the Republican’s healthcare “…legislation is overwhelmingly opposed by the American people” reflects USA’s Today’s findings. Though he is loved by his supporters, the love is not the same within the Democratic Party. Following Clinton’s loss to Trump, Bernie Sanders has lead the resistance in the Democratic Party by pushing for progressive reform in the party and rallying against the Republicans’ health care plan. Some within the party are critical of Sanders policies and have opposed his plans for example Bernie’s medicare plans. This fall out has lead to cases where there has been in fighting between the two factions within Democrats at state level. So, has everyone moved left in the Democratic Party? A majority of the Democrats in the Senate did back Bernie’s bill that would raise the federal minimum wage in contrast to $15 in contrast to in 2015 when he introduced it only 5 senators supported it. Leading Democrat Senators such as Kirsten Gillibrand, Kamala Harris, Elizabeth Warren and Cory Booker have all expressed their support for ‘Medicare-for-all’. This highlights the clear shift within the party, when only in 2016 last year Hillary Clinton said single-payer “will never, ever come to pass”. Polls have now showed that there is an increase of 19% of Democrats who want to see a single-payer system . 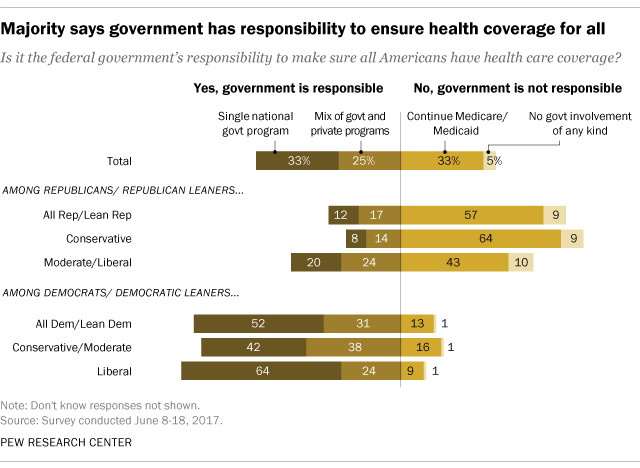 In this poll by Pew Research Center 60% of Americans believe the federal government is responsible for covering healthcare for all. Even now 33% favour a single-payer system to health insurance, which is up 5% since January of this year and 12% since 2014. There is now more support than ever for single health insurance run by the government rather than a mix of private companies and government initiatives. 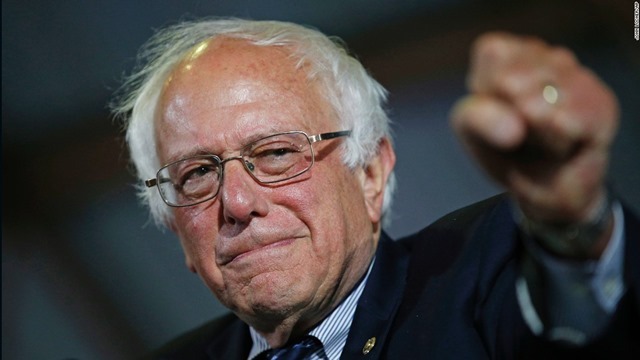 The Democrat party needs to now get behind Sanders and his new way of doing politics, otherwise they will be in disarray again in the upcoming mid-term elections and in 2020. Voters have taken a liken to Sanders’ sincere engagement in politics and how he reaches out to everyone. This is a strategy that all Democrats should seek to learn from to differentiate themselves from the Republicans. There are claims that Bernie is to run again in 2020 however he has said that it is “too early” to talk about. Donald Trump, would lose in 2020 if Bernie Sanders was to run according to Public Policy Polling. Trump would lose to Bernie by a 52-39 margin (poll also showed Trump would lose Joe Biden by a greater margin and a 7 point margin margin by Elizabeth Warren). Just like Trump, Bernie is an outsider to the ‘establishment’ as an independent senator. This is to his advantage as he has and will continue to gain popularity with those who feel underrepresented by the Democrats and the Republicans. Sanders’ popularity driven by activism, is another similarity shared with Jeremy Corbyn. The left is not dead in America folks, its a new left, a left that rejected Hillary and a left that focuses on those left behind. Its Bernie’s Left. We know how Corbyn has faced criticism from his peers across other parties but also within Labour and at times his own Shadow Cabinet. Following the general election, his popularity has surged with a poll conducted shortly after the election showing Labour five points ahead of the Tories at 46%. It also showed Theresa May approval rating had gone down by minus 17 and in contrast Corbyn had gained 17 points. Jeremy Corbyn surprised all political commentators by gaining 34 seats including constituencies Kensington and Chelsea and Canterbury which were under the Tories previously. The Labour leader benefited from the youth vote and his policies that connected with the general public. In a recent poll by the Evening Standard , Jeremy Corbyn has taken his best ever rating and overtaken Theresa May. Forty-four per cent of adults are satisfied with Corbyn compared to May’s 34% and her government’s 28%. This poll highlights the strong dissatisfaction with May and is the lowest rating for any modern-day Prime Minister after an election. It also shows that Theresa May has become more unpopular than the early days of Corbyn’s Labour leadership. This all demonstrates that there has been a shift in the left but to what extent? Is it only because of the poor performance of May during the election campaign and dislike for the government’s policies for example its refusal to raise public sector wages? We will only truly know if there was to be another election and then can observe whether his popularity will translate into votes. Also, maybe we will see whether that has been a true shift to the left in Labour and the general public has taken place if May was to resign with a more popular Tory to replace her. Bernie and Jeremy have not been afraid to move everyone to the left, whether its within the party they represent or the general public. 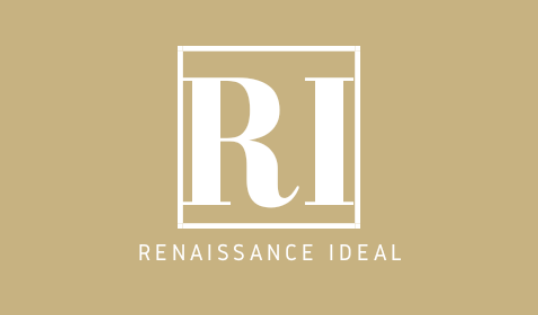 It can clearly be seen that that there has been a strong shift towards their views with more supporting their policies and ideas. However politics is cyclical, all it takes is one event to shift the conversation back towards the right again. For now Bernie and Jeremy can keep their boxes in and press forward to the left.